This is my first experience with Dressystar, who kindly gave me the opportunity to review one of their items. They have a simple, hassle-free website and a large selection of products, from casual clothes to prom dresses and everything in between. 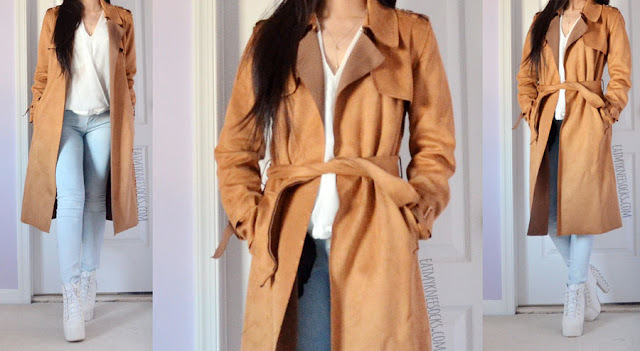 I decided to pick out a longline faux suede trench coat, sold on Dressystar's site in camel and gray, sizes S-XL. This tea-length coat features long sleeves, a fold-over collar, and a detachable belt, so that you can wear it open-front to show off your outfit, or wrap it up to keep yourself warm. It's constructed from a super soft faux suede fabric, with buckles at the sleeves and button accents at the shoulders for a twist on the classic trench coat silhouette. 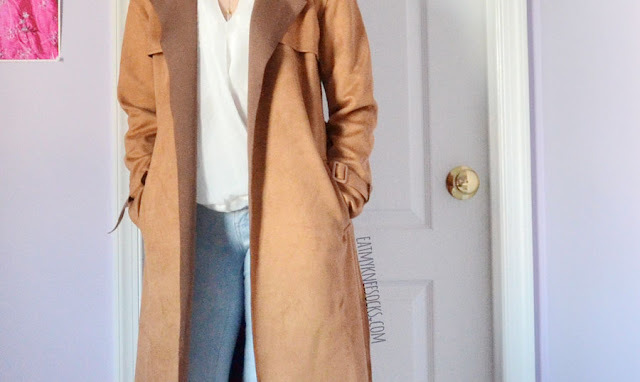 I originally wanted this coat in the gray color, but ended up getting the camel color, and I'm pleasantly surprised with the result! 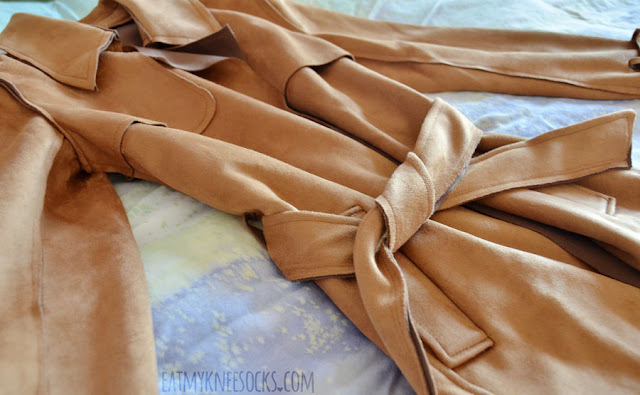 Although I'm not typically a fan of brown and tan-toned clothing, this coat has a very chic, classic look to it, perfect for an autumn or spring outfit. The jacket fits true to size, with sleeves that are the perfect length on me, plus two pockets at the front. It looks great with or without the belt, and even though I was skeptical about the design because it didn't have buttons, it looks really nice in person. 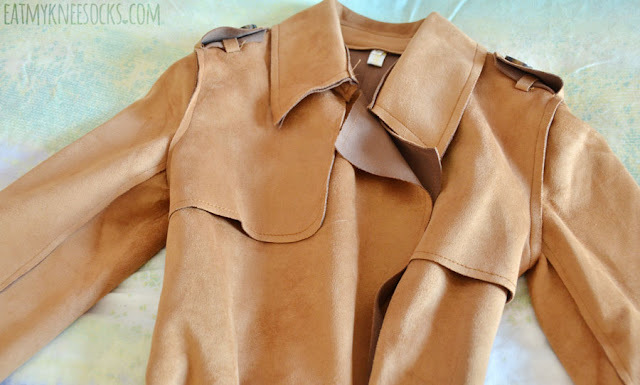 My favorite thing about this piece is the material; faux suede is always a trendy pick for the autumn and winter months, and the texture just feels amazing when you wear it. 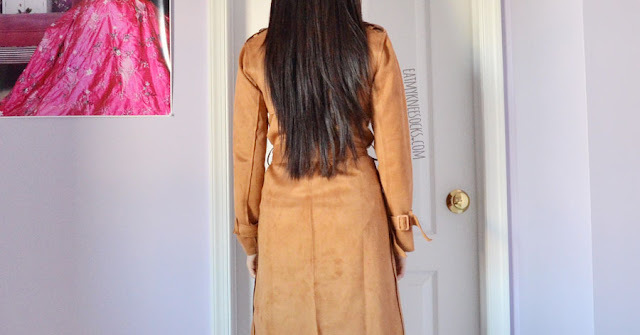 The faux suede fabric is super comfortable and a lot more lightweight and flexible than your regular trench coat material, which gives the coat a sort of flowiness and movement without losing its structure. Of course, since the fabric is on the thinner side, this is more of a spring/fall piece. 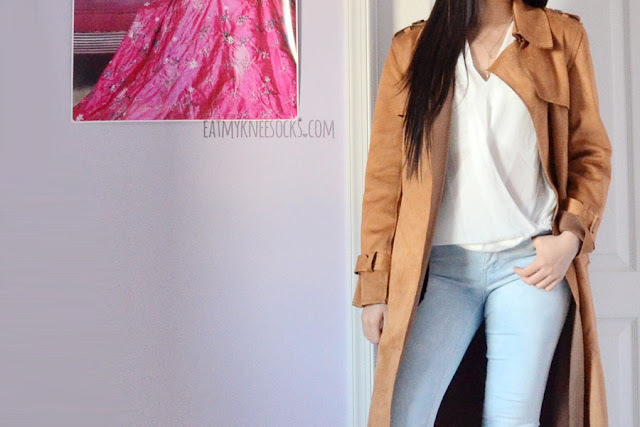 Here, I paired this tea-length coat with a white semi-sheer chiffon wrap blouse (reviewed here), light wash denim skinny jeans, white heeled booties, and a simple pendant necklace for an autumn-ready city-chic look. For a sweeter, more feminine outfit for the spring, you could style this piece with a crop top, skater skirt, over-the-knee socks, and short boots. The quality of this piece is great aside from a few loose threads near the collar, and the look of it, though different from my usual style, is stellar. It's a piece that elevates the simple, easy-to-wear silhouette of a trench coat or long overcoat and elevates it with the unusual fabric choice, creating a look that's casual and elegant at the same time. 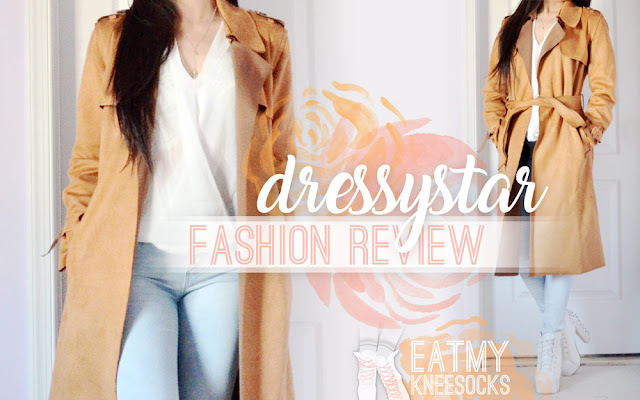 Given that I've never reviewed clothes from Dressystar before, I wasn't sure what to expect of this piece, but to my surprise, the longline faux suede trench coat looks and fits exactly as described on the store site! The price is pretty reasonable for such a coat, and despite it being a change from my regular style, I love the chic, classy feel of this piece. I'm a bit disappointed that I was sent the wrong color since I really wanted to try out the dark gray version, but thankfully the tan colorway looks even better in person, and the fabric really gives this coat its edge. As always, thanks for reading! I hope you found this review to be helpful, and feel free to leave and questions or comments below!